Nothing don’t mean nothing honey if it ain’t free, now now. 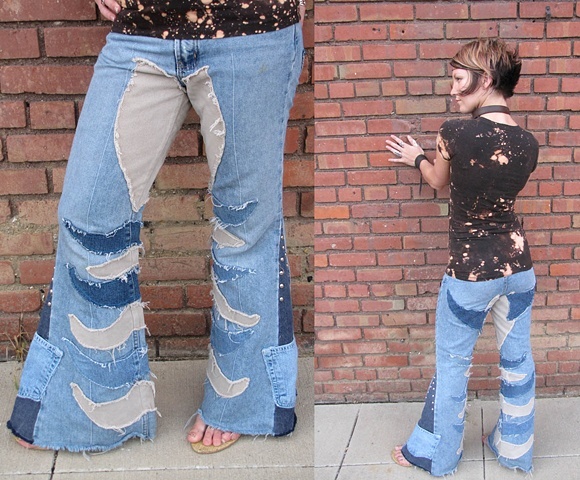 These are jeans that i can customize for you. i insert the bell bottoms and sew on the extra pockets and the strips of jeans material and i'll put the studs on the flares as well. Made from pieces and parts of recycled jeans! Here's how it works. . . .
Or send me a pair of your own jeans and i can make them look like these! Some of the patterns and the exact color of the jeans will vary of course and no two are exactly alike which is what makes them spectacular. contact me if you have any questions.